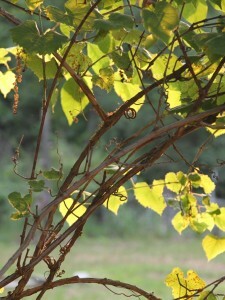 The late afternoon sun filtered through the vines; early autumn was her favorite time in the vineyard. The warm, sweet scent of fruit hung in the air like temptation, the crush just past, grapes trampled into the earth – a heady aroma filled her mind with the possibilities this harvest would bring. Buying this place had been her dream, a dream they’d shared. Now, she faced her first year alone, determined to carry on for them both. Losing him had cost her more than she believed she had to give. Picking up the pieces had taken everything that was left. This was his wine. She already knew its name: Amour Duré. Love Endures. Hi Erin, this was really sweet. Sad and real though. I liked it. 🙂 Mine’s on the list. Thank you, Raina. I appreciate it! I loved this, it almost made me wonder if she had lost him to death or leaving with the sentence ‘cost her more than she believed she had to give’ as it hints to me of really having to struggle to save her place. I think I lifted that line from a song, but for the life of me, I don’t know which one. It *feels* familiar. A sad piece but full of imagery, especially in the first paragraph. Enjoyed it. Quite a lot said in a few words. Full of emotion and imagery. Nice! A bittersweet way to accomplish a dream. Very enjoyable. Thanks, Adam. It felt a little ‘romantic novel’ to me, but it’s what came out, so there you go. Thanks – hope to read something from you soon! Beautiful. Good combination of sadness and determination to carry on, something we all have to do at some point in our lives. I’m glad she made it through and will have this place and wine to remember him. Thank you – some of it is familiar from recent losses, so it came through fairly real. Great story telling. You packed a lot of emotion into a few words. She’s barely holding on…but she IS holding on. Powerful. Yes, that’s what it takes to get through things – just keep moving forward. Thank you – if I ever do own a winery or get to name one, that may be on the list. The first paragraph set the story up beautifully. A tightly woven piece, sadly romantic and the end. Russell, it must be fun living in your head. You come up with some amazing ideas. You entertain me. ahh… nicely told, but love endures what? You left me curious. Love endures …. sort of like “the Dude Abides”. (reference The Big Lebowski). Love is a timeless thing. true — but doesn’t the heart need feeding, and hope ? Thank you, Atiya. Going to read yours next…. Love lives on inside the hearts of the ones they leave behind. sad but sweet. Exactly…that is our only real shot at immortality. Endearing story. Sad but serene. Great work. Lovely, sad and emotional story. Really enjoyed reading it and have done a few times. I like her strength in carrying on. I’m so glad you enjoyed it. It felt right – but then after reading all the variations that others came up with, I have new ideas. Every Friday is like that…. Very sweet and mournful story of love shared beyond the here and now…great! Bittersweet. It must be hard to pick up the pieces and go on without him. Not easy taking care of a vineyard alone. Yes love endures but hope he left her a nice insurance policy. It’s hard to have a dream hit a bump…but I’m glad to see she is picking up the pieces and moving on. How beautifully bittersweet. A full story in 100 words is hard to do but you did it! I almost shed a tear. Very evocative!